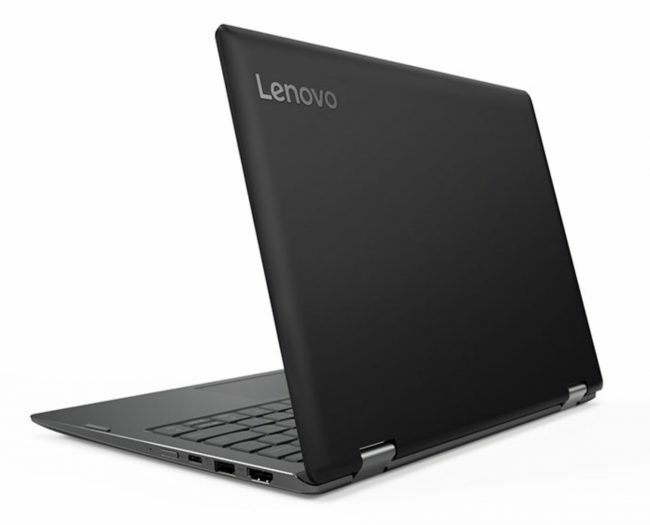 The Lenovo Flex 6 11” Convertible is designed to be a small, light, take-anywhere laptop. It measures 11.6” by 8” by .7” and weighs just over 2.6 pounds. 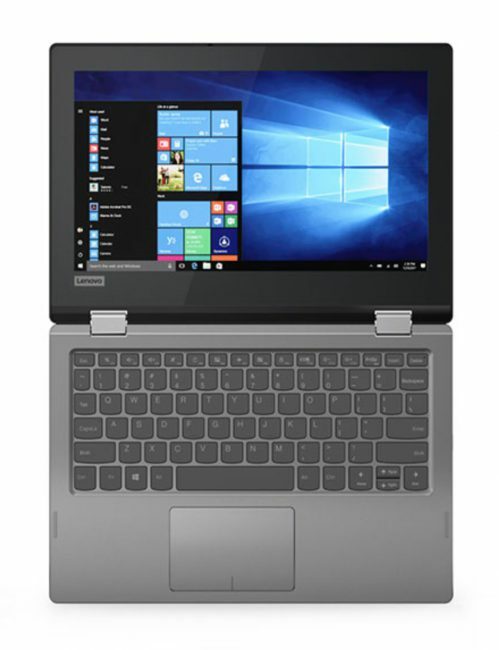 It may be small, but the laptop is packing Windows 10 Home, comes with either 2 or 4GB of RAM, and it is available with up to 128GB of storage. There are two versions of this laptop. 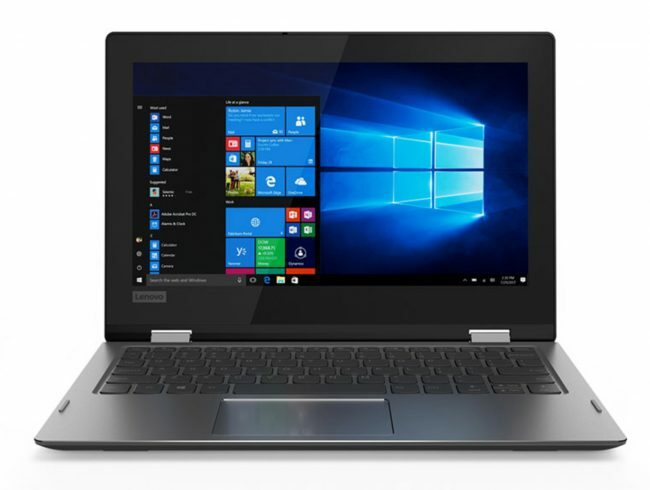 One comes with an Intel Celeron N4000 Processor (1.10GHz, up to 2.60GHz with Burst Technology, 4MB Cache) while the other has an Intel Pentium Silver N5000 Processor (1.10GHz, up to 2.70GHz with Burst Technology, 4MB Cache). The laptop has an 11” screen with a surprisingly thick bezel. It doesn’t bother me, but it does give the laptop a bit of a retro appearance. It has a 1366 x 768 display that delivers as much glare as anything else. 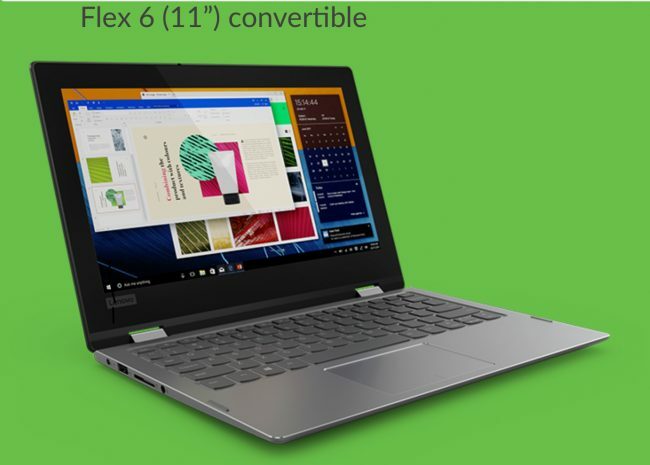 Sleek and Easy: Simplify your life with the convertible Flex 6 11”. 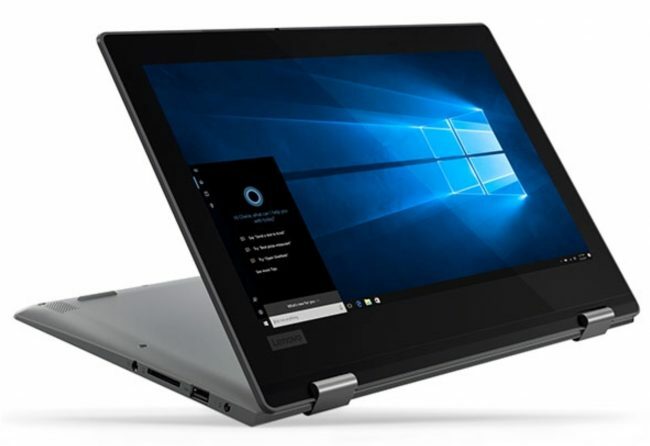 Feather-light at just 2.6lbs / 1.25 kg, it’s packed with high-value features—including powerful Intel® processing, Windows 10, and the versatility of multiple connection ports. You’ll be able to handle any task life throws your way. Take it anywhere: The Flex 6 11” is designed for your busy life. Light-weight and comfortable to use, this chic convertible transitions seamlessly from work to play. The first challenge I encountered with the Flex 6 11” is the battery life. While this is positioned as a convertible laptop you can take anywhere it only gets 6 hours of battery per charge. That’s pretty anemic by today’s standards. Fortunately, the Flex 6 11” offers fast charging; 15 minutes plugged into an outlet will give you up to 2 hours of extra computing time. Also, the laptop has “always on charging” which means you can use the battery in the laptop to charge your devices even if the laptop is not powered on. Performance and portability: Powered by Intel Pentium Silver processing, the Flex 6 11” offers exceptional mobile computing power for next-level work, study, creativity, and entertainment in a portable package. It also packs a punch, with lightning-fast boot-ups and transfer times. Use more apps, large programs, and files without slowing down. That may well be true of the version that has the faster processor and 4 GB of RAM. My review sample was the version with the slower processor, 2GB RAM, and a small amount of storage. It took quite some time to initially boot and was slow when coming out of sleep mode. This isn’t something that would have troubled me a few years ago but, coming from an iPad Pro 10.5” I’m used to having a machine that is all but instant when you take it out of sleep. Then again, for under $350 you can’t expect to get something that is going to be as fast and powerful as a laptop or tablet costing three times as much. As mentioned, the Lenovo Flex 6 11” runs a full version of Windows 10 Home. If you are based in Windows and need something that can run all your favorite Windows apps, this is a small machine that will let you do just that. Looking to edit photos in your favorite Windows image editing app? The Lenovo Flex 6 11” can do it. Looking to run a full suite of Microsoft Outlook rather than apps that provide most of the functionality? The Lenovo Flex 6 11” has you covered. Redesigned with your comfort in mind: The Flex 6 11” features an ergonomic keyboard for maximum comfort and a redesigned touchpad for a more precise user experience with multi-finger gestures. Touch, click, and zoom—you’ll feel the difference. 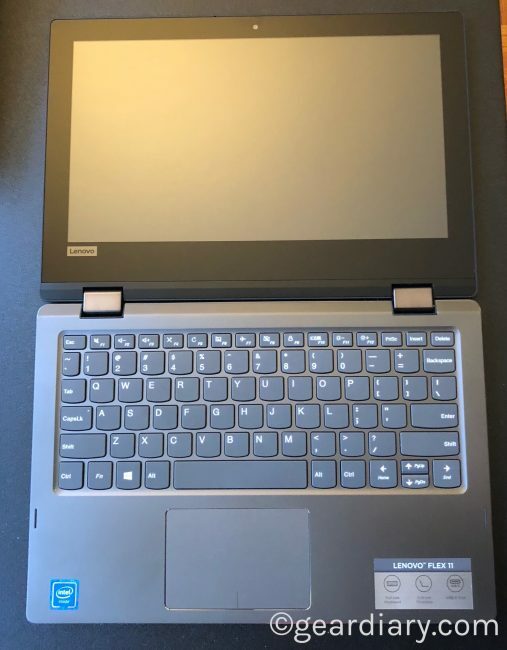 And if you are looking for something with a real keyboard and trackpad but is still small enough to carry with you wherever you go, the Lenovo Flex 6 11” has you covered there too. 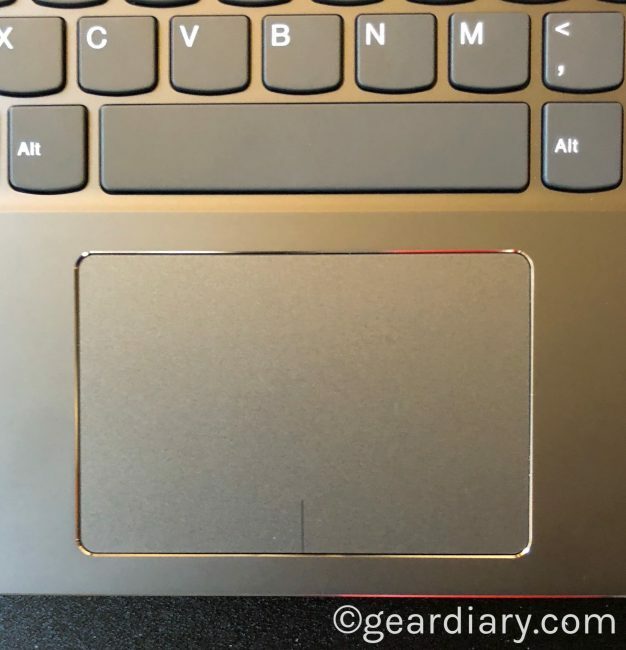 In fact, I found the keyboard and trackpad to be among the aspects of the laptop that I liked the most. That, of course, if coming from someone who has tried, unsuccessfully, to use my iPad Pro as a laptop replacement. I love the fact that this is a true convertible laptop with a responsive touchscreen. That means you can use it in laptop mode. And you can flip the screen all the way around and use it in tablet mode. 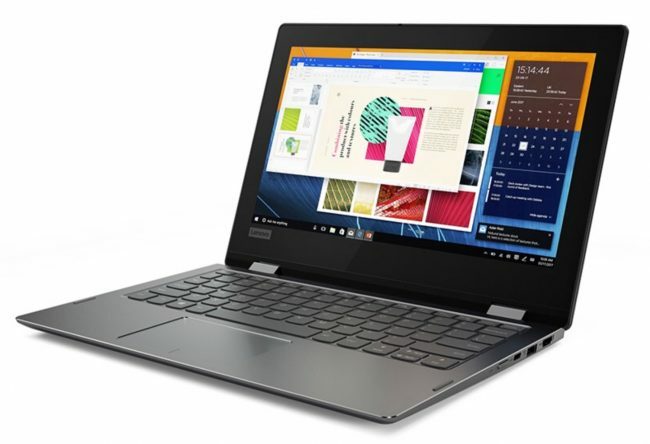 That kind of Lenovo flexibility is worth a tremendous amount since it means you only need to carry one device for work and for play. 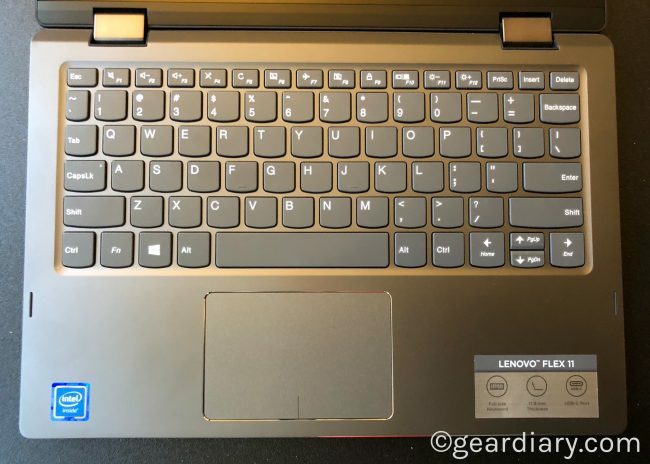 Overall, my experience with the Lenovo Flex 6 11” is a bit mixed. On the plus side, there is the price, the size, the fast charging battery and the ability to have a full Windows PC with you pretty much anywhere you go. 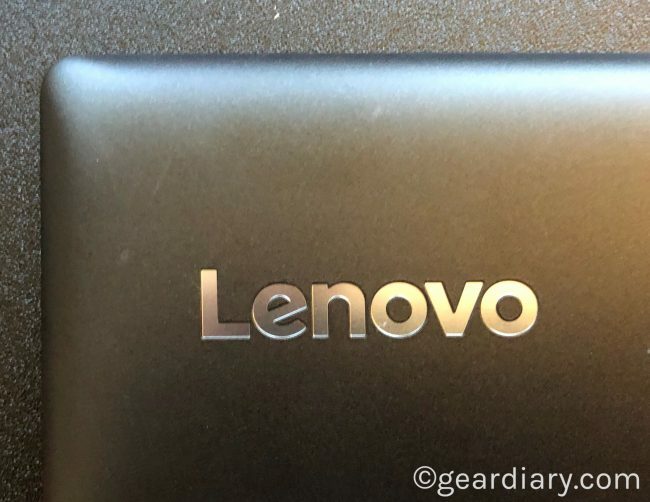 There is also the build quality which is, as one might expect form Lenovo, impressive and the inclusion of 2 USB-A ports, 1 USB-C port, a full HDMI port and a 3.5mm headphone jack. 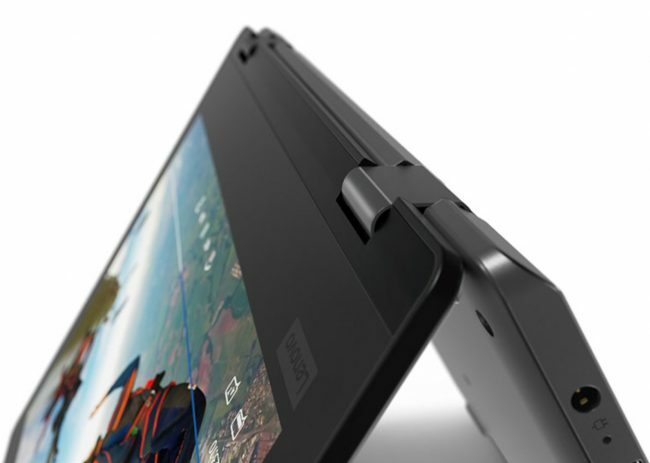 In addition, there is the excellent hinge which, as the name suggests, gives you the flexibility to use the computer in laptop, tent or tablet modes and the responsive touchscreen. The pros are rounded out by the comfortable and responsive keyboard and trackpad. I have yet to encounter a keyboard for my iPad Pro 10.5 that comes close to the comfort and responsiveness of this keyboard and, of course, iPads don’t work with trackpads at all. On the negative side, there is the fairly short 6 hour battery time per charge and the relatively significant weight for a computer this small. My 13” MacBook Pro gets 10 hours of computing per charge and doesn’t weigh significantly more than this laptop but, then again, I paid over $1500 for it. The biggest issue is, of course, the sluggish performance. The laptop takes forever to start when it has been shut down and isn’t that much quicker when coming out of sleep. It is worth noting that the $279.99 model (MSRP is $329.99 but the current web price is under $280) I was sent as a review loaner has just 2GB of RAM and 64GB of solid-state storage. For a bit more, you can get the same laptop but with 4GB or RAM and 128GB of storage. Everything else remains the same, but doubling both the RAM and the storage for just a few dollars is definitely worth it if you are going to use this laptop for anything more than the most basic of computing. The other option, of course, is to get a Chromebook. But while it will likely be faster, it won’t allow you to have the same Windows experience. All in all, the Lenovo Flex 6 11” is an interesting animal. If you are looking for a small, inexpensive laptop to take with you on business trips or vacations, or you need an extra computer in your home and don’t want to spend a lot of money, this may be a great option for you. Many of the sub-$400 laptops I have tried feel more like toys than serious computers. That isn’t the case here. This is a real computer that allows you to get real work done during the day and can serve you well for fun too. You can get it for less than an iPad mini and for the same price as the new 9.7” iPad and, if you do, you’ll have a real computer that can double as a tablet rather than a tablet whose manufacturer is trying to market it as a laptop replacement. Check it out here.